For many centuries before the feast of the Visitation was instituted, July 2nd was kept as the feast of the martyrs Ss Processus and Martinian, who remain as a commemoration on that day in the Extraordinary Form. 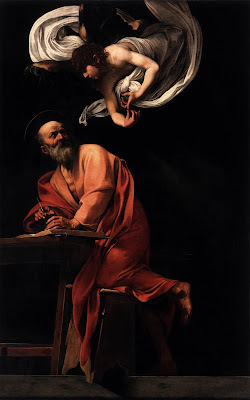 According to a legend current since the sixth century, they were the jailers in charge of keeping Ss Peter and Paul in the Mamertine prison in Rome during the reign of the Emperor Nero, and having been converted by the Apostles, allowed them to escape. For this, they were put to death after a long series of torments, through which they simply said over and over again, “Blessed be the name of our Lord, Jesus Christ, whom his blessed Apostles have preached!” Originally buried in a cemetery off the via Aurelia, their remains were transferred to the ancient Basilica of St Peter by Pope Paschal I in the early ninth century. The north transept of the new basilica is named for them, where their relics are kept under the middle of the three altars. 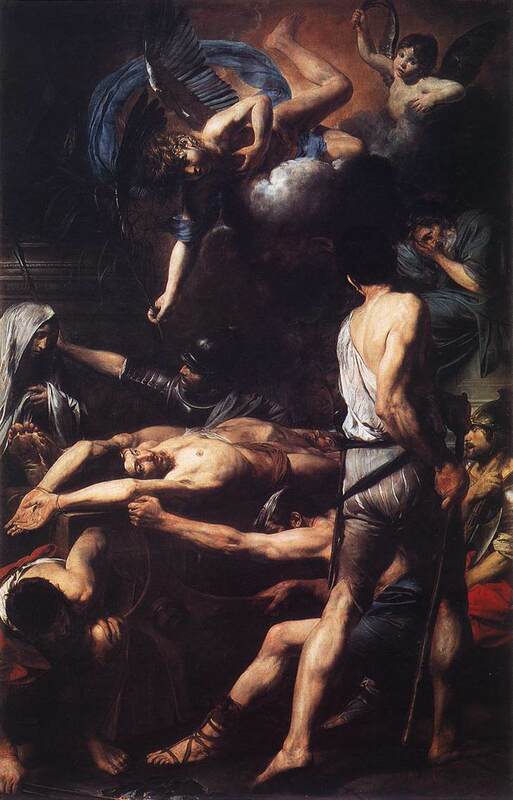 The central altar is where this painting of their martyrdom, by the French painter Valentin de Boulogne (1629) was originally displayed; it is now replaced by a mosaic copy. 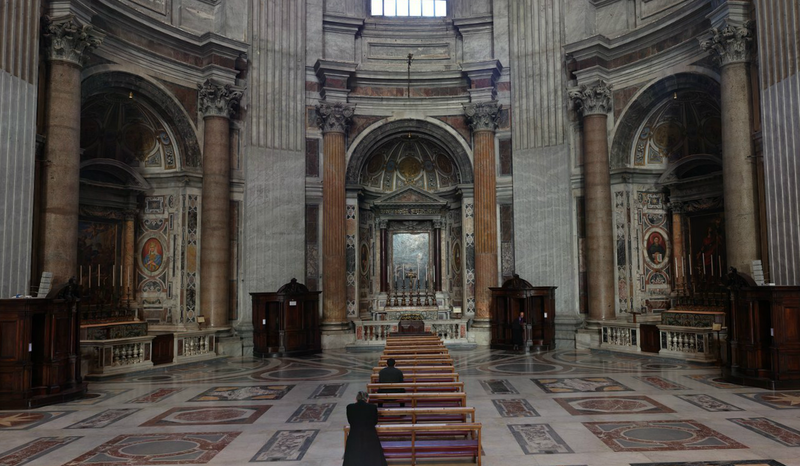 Since the windows of St Peter’s Basilica are so high up, the marble walls are never exposed to direct sunlight for any great length of time, and generally remain cooler than the air. In the summertime, when Italy is often very hot and humid, a great deal of moisture comes into the building and condenses on the cooler marble. 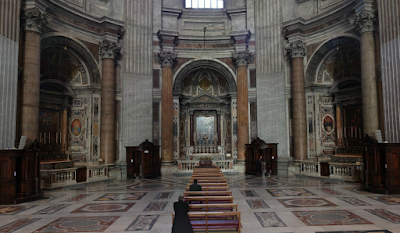 In the middle of the 18th century, it was realized that the paintings over the altars were being destroyed because they had a slick of condensation over them for several months of the year; there were therefore all taken down and replaced by mosaics. The original is now in the Painting Gallery of the Vatican Museums. 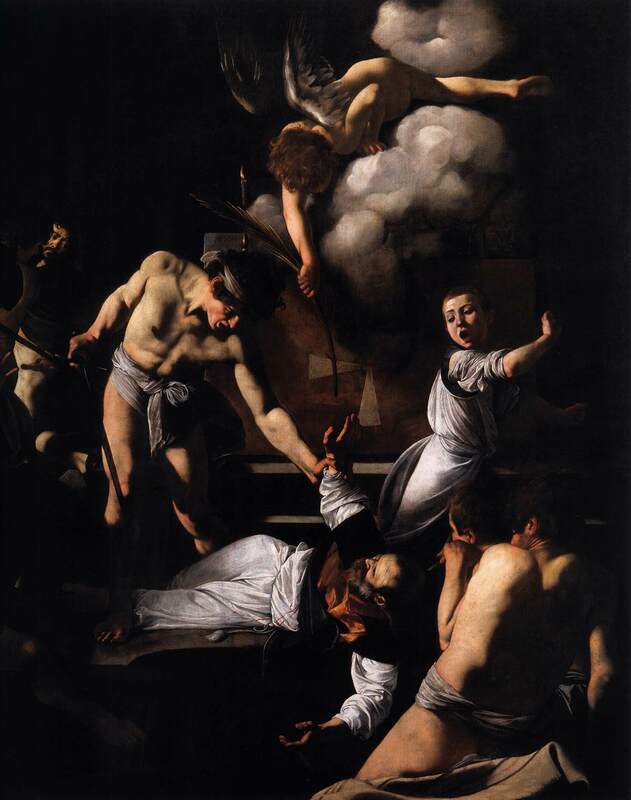 Valentin was an unabashed plagiarist of Caravaggio, in terms of both style and subject. 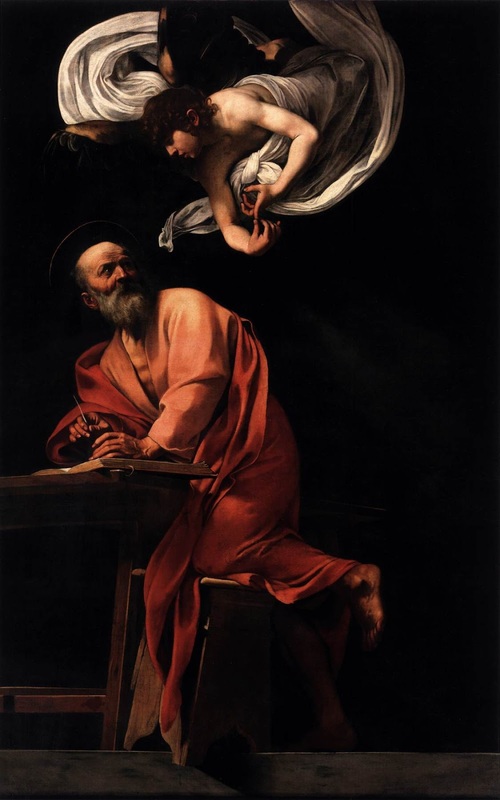 One of the latter’s more prestigious commissions was a series of three paintings of the life of St Matthew in the Contarelli Chapel of the church of San Luigi dei Francesi. The angel whom Valentin shows here bringing the palm of victory to the martyrs is essentially a cross between the two angels painted by Caravaggio, one inspiring St Matthew in the writing of the Gospel, and the other bringing him the palm of martyrdom.